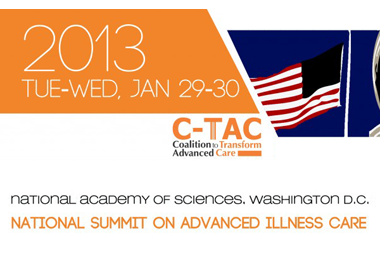 Trillium planned logistical and communication aspects of the Coalition to Transform Advanced Care’s (C-TAC) first large, national summit for business, healthcare, community, and nonprofit leaders as well as policymakers. As a young organization with little experience in organizing large-scale events, C-TAC relied heavily on Trillium’s strategic planning to design a vision for the conference and raise the visibility of issues affecting people with advanced illness, their families, and their caregivers. Trillium consulted on communication and marketing issues such as messaging, branding, and a person-centered theme for the Summit while managing event planning details large and small. The result was a hugely successful two-day event held at the National Academy of Sciences in Washington DC, attended by nearly 500 health care decision makers who learned about the issues and created a roadmap for the future. Trillium also created clear and consistent content for CTAC’s new Care Journey website based on the lengthy contributions of more than 20 experts.